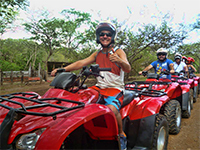 ATV tour Guanacaste, the best adventure tour on a fourtrax atv in Tamarindo beach. ATV tour Tamarindo beach, an unforgettable adventure. On an ATV you can discover the best routes in Guanacaste that you never thought you'd see. We have a fleet of ATV's HONDA, all equipped to satisfy your needs as you enjoy our tour. From the nearby beaches to the beautiful tropical dry forest, you'll enjoy the altitudes of the mountains surrounded by panoramic views of the coastal Pacific North. As a natural complement to our tour, we'll encounter a variety of flora and fauna native to the Guanacaste region, the amazing Guanacaste trees, the conservation of the Pochote trees (the valuable wood in danger of extinction) as well as the reforestation of Teak trees, all of which provide accommodations to a variety of monkeys, pizotes, armadillos and birds. Finally you will get to know one of the most beautiful beaches in the world "Beach Pirate Bay", where we stop for a refreshing swim in crystalline water and will end at our private farm.